You know about RED and its professional cameras used by filmmakers and you probably know about Lucid, which created LucidCam, the first 3D 180 degree camera. RED and Lucid are working on a professional camera, which they call an 8K camera but it actually uses two 4K sensors, so it’s not really 8K (real 8K has four times more resolution than 4K). But what really sets this camera apart is its ability to shoot holographic videos. What is RED’s 4-view Holographic Format and How Does It Work? To understand why this camera is groundbreaking, we need to understand RED’s 4-view holographic format. It’s a bit easier to explain it by contrasting it with conventional 3D photos and videos. When you view a 3D stereoscopic photo or video, it looks 3D (binocular parallax) but when you move side to side or up / down the perspective doesn’t change correctly, and your brain recognizes it as not being ‘real’. With RED’s 4-view holographic (h4v) format, the object will appear 3D without the need to wear glasses (binocular parallax), and at the same time, the perspective changes correctly as you move around the image (head motion parallax), making it seem like it is floating over or under the smartphone or tablet display surface. It’s hard to show it, but this demo uses the same Leia display technology as RED’s Hydrogen Phone with holographic display. UPDATE: tech blogger Mike Cane (Atomic Supermen) spotted this video of another phone with holographic display — this one’s by Samsung. The video was shot by Upload VR. This seems to be what RED is probably like. The technology is impressive, but where will the content come from? That leads us to the new camera. 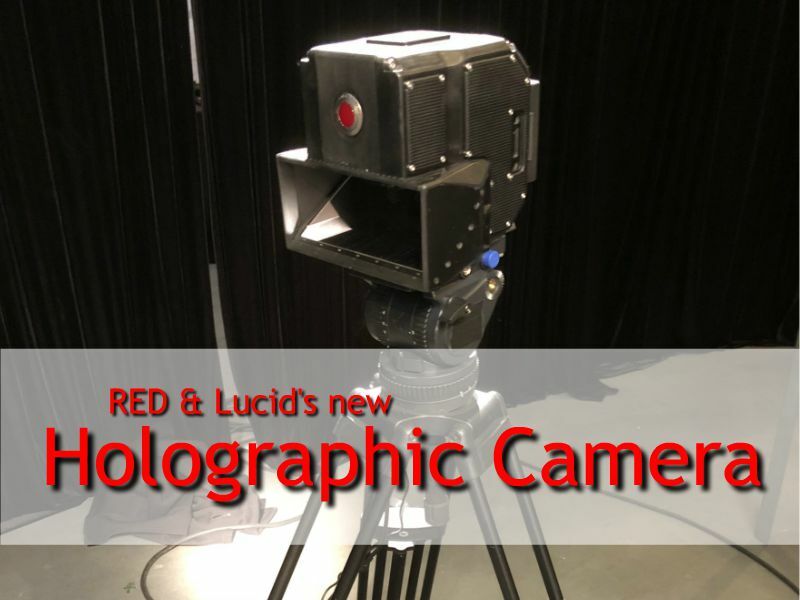 Details are sparse for RED and Lucid’s camera but it will use two cameras and a beam splitter. RED has previously said that four cameras are required to capture an h4v hologram. With the new camera, the beam splitter will enable each camera to capture two views, for four views total. Lucid will be contributing its 3D Fusion software that can combine the images together, enabling users to see the h4v hologram almost in realtime. You may be wondering how a user will preview the image? 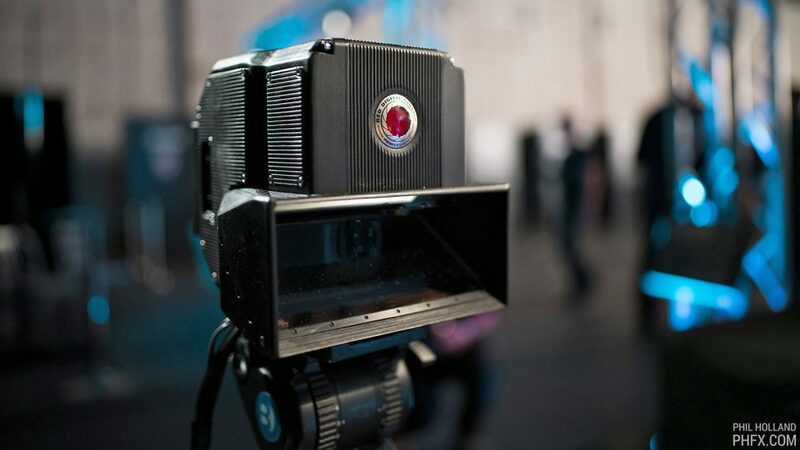 The camera can actually use a RED Hydrogen phone, which has a holographic display capability. I don’t have any details yet, nor samples but if they ever deign to show samples, I’ll post them here. What do you think of this format and this camera? Let me know in the comments! My god!! Tech is moving so fast lately, any info/thoughts on cost? > The camera you see here is a holographic camera. How is this a “holographic” camera ? All I see is a traditional two-camera rig with one shooting through a half-silvered mirror – the type of rig used by the movie industry for decades. The main novelty appears to be that the two cameras are mounted in one body with the mirror built-in. A four view camera is not holographic. One of my rigs has eleven cameras and some colleagues use up to 60 cameras. They’re still not holographic cameras. So it is claimed. But is this really the case or is it not simply that the image remains 3D no matter how the display is angled ? The problem with this claim is that the display cannot show angles that were not recorded by the camera. And a camera such as RED showed – that has a very small interaxial – cannot see any more around an object than a regular stereo camera could. > With the new camera, the beam splitter will enable each camera to capture two views, for four views total. But the picture just above your text shows only one lens in the back – suggesting two lenses only. > What do you think of this format and this camera? As one who has been shooting 3D for 38 years and designing most of my camera rigs and as one who has been examining and testing several types of glasses-free displays over the last five years, I am very curious to see how much of this is really different from what already exists or if much of it is hype. The problem with the reviews we hear from those who saw the Hydrogen One display is that they come from people who have not viewed any of the glasses-free technologies developed over the last five years. They invariably bring up low resolution 3D phones from 2010 or the equally low resolution 3DS. But none of them have seen the newer high resolution displays from CVision, K3DX, SuperD (with very efficient eye-tracking technology) or UltraD (displays eight views simultaneously), So they don’t really have anything current to compare it to. But just how often would one do this ? When you stand in front of someone in real life, do you keep moving to the left or to the right to make sure the person is real ? Or when you look at a phone or tablet do you keep moving your head left to right or do you look at it from straight on ? My point is that most people look a t a 3D display from straight on and lenticular displays will provide a very convincing 3D image in that “normal” viewing condition. And for those that like to move about while looking at a display, the eye-tracking on SuperD phones is very efficient in maintaining a clear 3D image, no matter the angle of view. Get yourself a P8 3D at $150.00 then go compare it to an actual Hydrogen One. Sure, it may be a bit better, but is it $1150. better ? Hi Francois. I havent seen it myself so i dont know for sure but i think it is both 3d and the perspective changes as well. I get that. But how can it show perspective angles that were not recorded ? The camera they show could only record around objects that are very close. And remember that the few people that did see that display saw it under controlled conditions with pre-selected subject matter. To give you an idea, the 11-cam rig I use to shoot subjects at seven feet has a base that is eleven times that of normal human eye separation to achieve that “rounded” look. So I remain skeptical as to what that narrow camera and display can actually do. It still remains that the biggest barrier to entry is the price. It won’t ever get mass marketed at this price level and most people won’t know what to do with the 3D effect, so they need to rely on content creators. But who will create for such a small number of buyers ? They say they’re looking for contracts from movie studios. But those are all regular 3D productions. Anyhow, SuperD did the same thing a few years ago, struck a deal with DreamWorks to stream 3D content to their displays and that didn’t help sales that much. One thing that everybody reviewing this phone with “H4V” display has neglected to mention is that it features a completely ordinary twin-lens stereo module on its back – pretty much the same as those that were found on 2010 3D phones such as the LG Thrill or the HTC Evo 3D. So… how is this twin-lens unit recording four views ? Same applies to the description by “the Verge” of 3D video chatting possible by the use of two (not four) cameras at the front. And of course I have to wonder how it can see around objects with such a tiny interaxial ! This leads one to conclude that content is recorded as traditional two-view stereoscopic and that interpolation is used between those views – pretty much the same as is done with UltraD. One thing that isn’t mentioned however is the fact that interpolation reduces the effective interaxial – therefore reduces the overall 3D effect – unless they’ve figured out some other way of doing it. SuperD uses eye-tracking instead and maintains full stereo effect. There are two things, a phone and a camera. I think the camera is a stereo rig with a beam splitter in each camera, so each camera records two views, giving horizontal and vertical parallax. The captured views are then interpolated to produce multiple views from new perspectives in between these four corners. The phone itself would have a light field display to reproduce the (virtual) camera array in auto-stereoscopic fashion. The display would have a very small field of view anyway, so you won’t be able to look around objects that are far away from the camera because the viewpoint would be out of the display field of view in the first place. I know. Read my other posts. I was referring specifically to the lenses on the phone itself. There are two in the back and two in the front. > giving horizontal and vertical parallax. > The captured views are then interpolated to produce multiple views from new perspectives in between these four corners. Yes. That’s the claim made. We really need to see it for ourselves ! Great find ! There have been signs over the last couple of years that Samsung has been working on glasses-free 3D technology. So I guess this is a first example of that. They are not the only ones. UltraD has demonstrated multi-view glasses-free technology for several years now. By the way, my impression of the tech shown in this clip is that it is multi-view lenticular. In other words, it uses a lenticular screen to display many more than the traditional two views of a stereo camera. The sample image shown appears to be CGI. Anyhow, it’s just a prototype whereas RED has a product in production now that is going to be released in a couple of months. We have to assume that phones with new holo displays will come with with new holo cameras? Or link multiple cameras to create real time holo footage? That’s somewhat unlikely. For one thing, this is not really a holographic display but a multi-view 3D display. Phones with 3D displays have existed for years and did not make much of a mark. The main reason is content. There’s no reason to believe this will be any more successful than others have been – especially considering that this display is only available on a single very high priced phone. How to create an interactive 360 video GIF (with samples)!